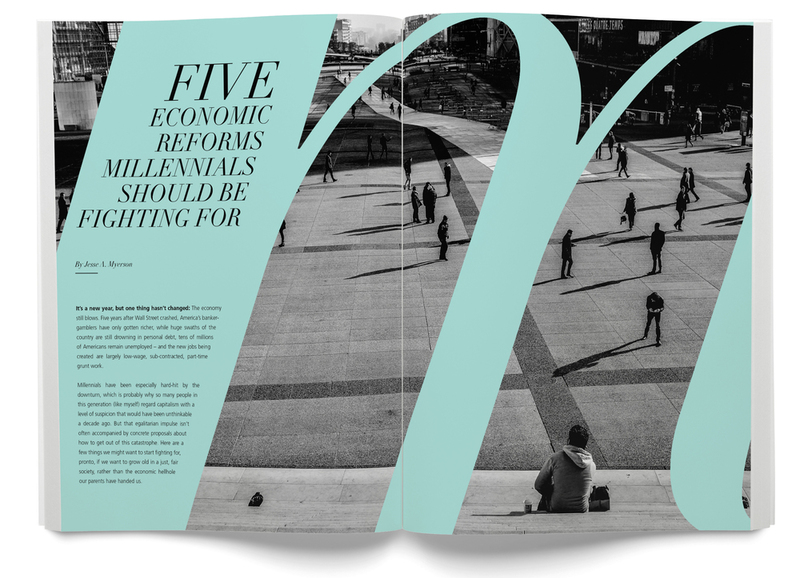 Design different stylistic variations of the article "Five Economic Reforms Millennials Should Be Fighting For", as featured in Rolling Stone in January 2014. Each interpretation has to be two spreads. All images are from stock photography sites that I edited heavily in Adobe Photoshop to match the style I needed. The first style addresses the millennial generation. By using very bold colors with strong lines across the page, each layout is meant to abstract different images for more visual interest. I also added an infographic on the side of the second spread for added information. The second style takes a more mournful approach. It targets the feeling that the world is in such despair and millennials are suffering for it. Black and white photography against a seafoam green color were meant to appeal to a younger audience while still keeping the very serious atmosphere. The softer section headings are less aggressive. The use of red and blue in this third style stand for solidarity and liberty, the things the writer of the article encourages. Very strong, bold typography highlight important areas of the text. A lot of the secondary content also bleeds off the page, removing any feeling of being trapped and constraint. The message is meant to burst out of the magazine. The red overlay over the images are meant to create an angry mood in the viewer, which is then further enhanced by the extreme contrast between red and blue. In order to differentiate itself from other gossip and tabloid magazines, the October 2013 issue of InTouch Weekly was redesigned for a cleaner and more sophisticated look. The more minimalist aesthetic is intended to focus the reader more on the content rather than the conflicting images found on a single page of the magazine. 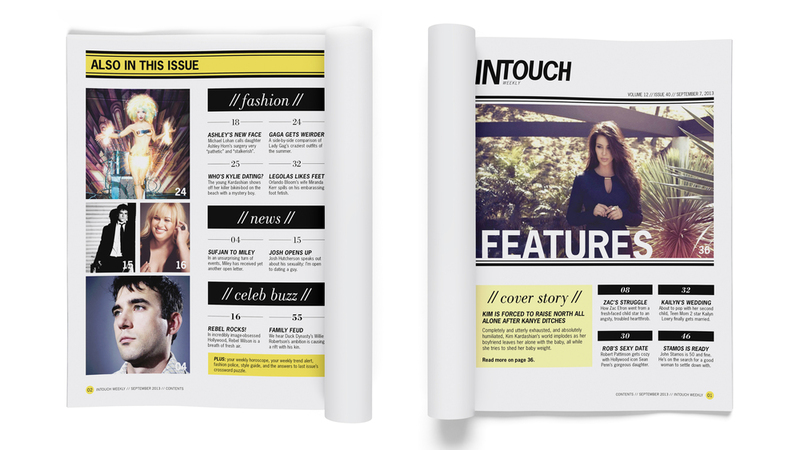 Attract new and existing readers to pick up a copy of an existing magazine through redesigning the logotype and the layout. A lot of magazines are embracing the transition from a print to digital space by building tablet applications that enhance the reading experience from a published article to include exclusive content and creative uses of interaction. Translate an existing article - "Reinvent Yourself" by Rebecca Webber with illustration by Tavis Coburn as published in Psychology Today - to a digitally published article viewable on an iPad. The content let itself very well to quirky, fun interactive elements. Because this is a digital version, special adjustments were made regarding types size (larger for legibility) and interactive areas (44px minimum to ensure seamless interaction).